June 6th, 1044 was one of the most important dates of the entire war. Our brave American soldiers invaded Normandy and took Omaha Beach by storm. The Germans put up a major fight and many American soldiers lost their fight. Captain John H. Miller survives and leads a surviving group of soldiers inland. Back in the United States of America, General George Marshall finds out that many families lost multiple sons in the war. One of those families is the Ryan family, three of four sons perished. He is concerned about notifying the poor mother of their deaths. The bad news on the telegrams maybe arriving on the same day and devastate her. Her fourth child James Francis Ryan has been declared missing in action in Normandy. Private first Class Ryan served with the Baker Company, 506th Parachute Infantry, 101st Airborne Division. Marshall decides to order a search for the fourth son Private Ryan. Captain Miller receives this order. Six men must join the search and rescue, each soldier with his own special skills including one that speaks German and French fluently. He has to put a plan in action even though he has no good information where they saw Private Ryan last. Their search leads them to an area in Neuville in hope Private Ryan is with the 101st platoon. 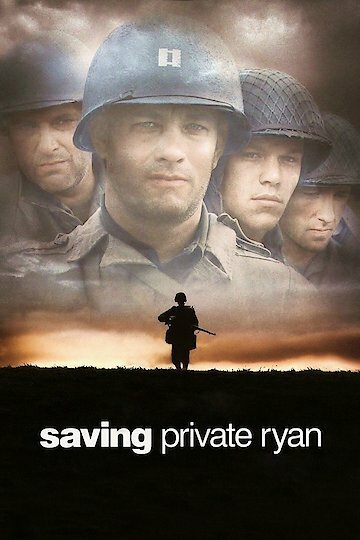 They find another Private Ryan but realize it is the wrong soldier. Finally, they make progress and locate someone that knew more about the whereabouts of Private Ryan. He knew that Private Ryan defended a bridge of importance to the strategy of the war in a town called Ramelle. The soldiers are encountering several German troops on the way to the town. They make it to the city of Ramelle, encounter a group of paratroopers, and find out that one of them is the Private Ryan. They tell him about the loss of his brothers and he is devastated. He tells the Captain that he does not want to go home; he wants to continue the fight and tells the Captain that he feels that his fellow Paratroopers are his brothers. Captain Miller decides to help defend the bridge and takes command. The enemy arrives with a multitude of men and weapons. The men put up a magnificent brave fight but loose three of their men. Captain Miller wounded mortally after a brave attempt to plant explosives and destroy the bridge. Private Ryan, Upham and Reiben survive. Many years later Ryan travels as an old man to the American Cemetery in Normandy France. Ryan honors Captain Miller by giving him a salute. Saving Private Ryan is currently available to watch and stream, buy on demand at Amazon, Vudu, Google Play, FandangoNow, iTunes, YouTube VOD online. It's Memorial Day, which means you (hopefully) have the whole day off to enjoy the sunny weather and a cold beer (or lemonade). But if the rain has barred you from any backyard barbeque, here are a few suggestions of classic war movies to keep you entertained, and give you a reminder of why you have the day off in the first place.